Creek Cottage is a beautiful, secluded property with a private hot tub. Located on a ridge right over Lynx Creek it has great views. WIFI is provided to stay connected. It's a very romantic accommodation perfect for honeymoons, anniversaries or private get-aways. Nestled between pinion pines and cottonwoods, Creek Cottage sits on the hillside overlooking Lynx Creek. This little hideaway is quiet, secluded and has many different decorating touches. The subtle colors in the tile floor bring out the reds and golds in the furniture, pictures and linens. The bedroom has a king bed, gas firestove and a deck with a jacuzzi. The other deck off the dinette has a patio table with chairs and an electric BBQ grill. An electric firestove in the living room heats the Cottage in the winter; an evaporative cooler and window A/C unit makes it comfortable in the summer. The living room has a Queen sleeper sofa for extra guests.The HDTV is connected to a streaming Blu-ray player with Netflix. The kitchen has everything needed for as much cooking as you want to do. The full bath has a tub/shower and double vanity. An additional vanity is in the toilet room. Hiking starts at the front door. Wander along the creek bank enjoying the lush vegetation, wildlife and redolent riparian fragrances. If exercise is on the schedule, hike over the hill and back. 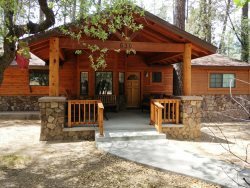 Lynx Lake is just 10 minutes away with fishing, tall pines and boat rentals. Major shopping and downtown Prescott are just 15 minutes driving. But if you are really just looking to relax, curl up in the rocker and read a book or magazine. We don't think there is a nicer accommodation in the Prescott area for this rate.